For a bean bag chair that will match just about any purpose or person, the Flash Furniture Oversized Bean Bag Chair is our top choice. This classic bean bag chair is comfortably sized with a diameter of 3.5 feet and is filled with polyurethane foam beads that are squishy yet supportive. One thing that really stands out about this bean bag chair is the fact that the outer cover can be removed for washing. This is a big plus for a seating option that rests on the floor and is likely to see snacks, sodas, and more. Fans of the Flash Furniture Oversized Bean Bag describe it as being comfy and plenty big enough for one person—or maybe two smaller people. While some people complained of their bags not being stuffed full enough of beads, most buyers are very happy with the fullness of this bean bag. Over time, the foam beads inside may compress, but this is typical for most bean bags. The bean bag is available in a wide variety of colors and various fabrics, making it easy to find one that will look perfect in your home or office. Settle into a bean bag chair without sinking a ton of cash, thanks to a budget-friendly option like the Big Joe Bean Bag Chair. This squishy bean bag with back support is a great choice for a bean bag chair under $75. Inside the sack, you’ll find polysterene beans that offer a cushy but supportive seat. We also like that the fabric is stain and water-resistant, making it more durable in the long run. People love the back and arm support offered by the chair-like design of this bean bag. It’s proven to be very useful as a reading or tv-watching spot for children and adults alike. The only common complaint is the somewhat limited color selection, as the chair is currently only offered in 4 color choices. But for a budget bean bag chair, the Big Joe is big on value and comfort. Never feel like you’re too old to sit in a comfy bean bag chair with the oversized FatBoy Bean Bag Chair. Its larger size makes it perfect for adults. This oversized bean bag chair is almost 6 feet tall and measures more than 4 feet across. Yet, it can be squished, slouched, and maneuvered into a variety of positions for your sitting comfort or tucked into a corner for storage. This bean bag for adults offers enough support to comfortably sit and read or it can be flattened on the floor for an oversized cushion to sprawl out on. While some other bean bags are smaller in size and leave adults feeling that they’re awkwardly perched on a tiny bag of pellets, the FatBoy has been described as a “beast of a beanbag chair” and “big enough for a grown man to enjoy.” Just note that there have been some FatBoy bean bag chairs that seemingly arrive with too little filling. So check your new bean bag carefully for stability and stuffing. The FatBoy comes in a wide variety of colors to fit any décor, and this is the perfect bean bag for adults to work, relax, or unwind. Memory foam has become an increasingly popular choice for bean bag chairs, thanks to its soft support and incredible comfort. The Chill Sack Bean Bag Chair is one of the top memory foam bean bags. The Chill Sack Bean Bag is filled with shredded memory foam in place of the more typical polystyrene pellets. The result is a bean bag that better conforms to the shape of your body and offers soft but firm cushion. Outside, this bean bag is covered in a soft microfiber cover that can be removed for washing. People love this bean bag chair with memory foam for sitting and sleeping. It’s been described as on par with some of the higher-end, name brand memory foam bean bag chairs. A few people added additional shredded memory foam to increase the support of the seat, but most people found it to be perfect as is. The toughest part of adding this bean bag chair to your home may be the competition to sit in it. Fortunately, its 5-foot size makes it easy to share with a friend or your pet. Tiny tots love having a special seat of their own, and a bean bag chair is a durable choice. The ECR4Kids Toddler Classic is a good bean bag for toddlers. With a 22-inch diameter, this small bean bag allows toddlers to climb, sit, and play on this bean bag chair available in an assortment of fun colors. This bean bag for toddlers also has durable kid-friendly features, like double-stitched seams and double zippers to keep the tiny beads away from little fingers. Parents appreciate the fact that the leather-like PU cover is easy to wipe clean and resists spills and stains. While this mini-sized bean bag is perfect for toddlers, it may be too small for older children. 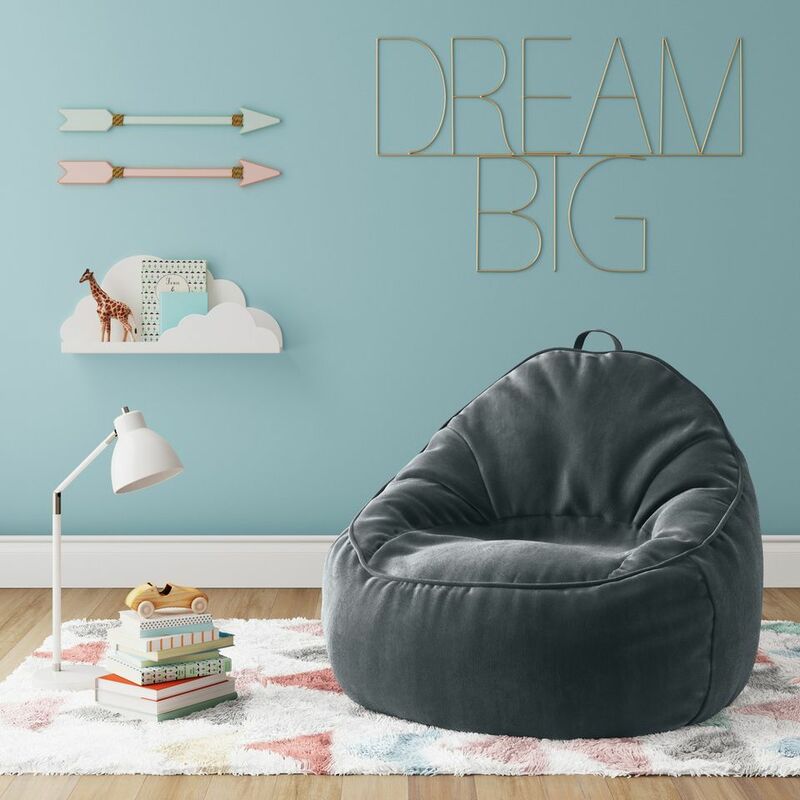 So keep in mind that you may need to upgrade to a larger size once your toddler outgrows this chair—but they’re not likely to outgrow the comfort and convenience that a bean bag offers! Your tween may be spending more and more time in their room—so give them a special spot to sit and relax. A bean bag chair is a comfy choice, and the Pillowfort XL Structured Bean Bag Chair is our top choice for tweens. This bean bag makes the perfect addition to your tween’s room or to the family’s favorite hang-out spot. The bean bag has the familiar rounded design but is described as being a little firmer and more supportive than traditional bean bag chairs. This is perfect for your tween to read or study in after school. It also has a removable cover, which is a huge plus in keeping the chair looking its best. Parents comment that while this bean bag chair for tweens is sized just right for their child, it also is comfortable for them to sit in. It’s rated to hold up to 250 pounds, and it can easily be reshaped or fluffed up with a quick shake. Maybe one of the most underrated uses for a bean bag chair is as a pool float and lounger. The Big Joe Captains Float Bean Bag is our favorite pick as a bean bag for the pool. Filled with UltimaX pellets that float, this bean bag is designed for aqua activities. The Big Joe Captains Floating Bean Bag features UV and mildew-resistant upholstery and also has tethering loops so you can tie it to your boat, dock, poolside, and more. If you’ve never thought to use a bean bag for the pool or boat, it is one of the most relaxing ways to float and soak up the sun. Pick up several for your pool patio or stow a few onboard your boat. People love the fact that this is a pool float you don’t need to inflate, and that it can be brought indoors for a comfortable spot to sit in the off-season.